Lintao (Rick) Qi received his PhD in Translation Studies from Monash University, Australia in 2015. A NAATI accredited professional translator between Chinese and English (both directions), Rick has been lecturing in the M.A. program of Interpreting and Translation at Monash University since 2012. Dr. Lintao (Rick) Qi is Lecturer of Translation Studies at Monash University. Rick completed his PhD research (Translation Studies) at Monash University in 2015 on the country’s prestigious APA/IPRS scholarship. Before coming to Melbourne in 2012, Rick was a freelance translator and English lecturer at Henan University, China. Having worked as a teacher and coordinator in a collaborative educational program between Australia and China, Rick is an enthusiastic advocate of transnational education and active participant in international research projects. He has been lecturing in the Master program of Translation and Interpreting at Monash University since 2012. Qi, L (forthcoming in 2018). Jin Ping Mei English Translations: Texts, Paratexts and Contexts. London and New York: Routledge. Qi, L and M. Roberts (eds). (forthcoming) Translation of Classical Chinese Novels. Beijing: Beijing Foreign Languages Teaching and Research Press. Qi, L. (2016) Agents of Latin – An Archival Research on Clement Egerton’s English Translation The Golden Lotus. Target: International Journal of Translation Studies.28:1, pp. 39-57. Qi, L. (2015) 《金瓶梅》西游记——第一奇书英语世界传播史. 明清小说研究. no.2, pp.233-246. 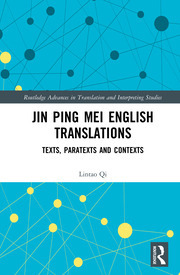 Qi, L. (2014) Researcher as Translator: David Roy and His English Retranslation of Jin Ping Mei. mTm: A Translation Journal. no.6, pp.39-51. Qi, L. (2013) 衣带渐宽，壮心不已——芮效卫与《金瓶梅》. 东方翻译, no.21, pp.59-62. Qi, L. (2016) Book Review: The Plum in the Golden Vase, or Chin P’ing Mei, translated by David Tod Roy, Published by Princeton University Press. Chinese Literature: Essays, Articles, Reviews (CLEAR), pp.214-218. Qi, L. (2015) The Seventh Day by Yu Hua, translated by Allan H. Barr. AALITRA Review: a Journal of Literary Translation. no.10, pp.25-27.